Any one that knows me even relatively well knows I’m into my cars and bikes. Ive been around bikes especially my entire life as my dad was always in the garage customising which ever bike he had most recently bought. I also spent a few years working as a trainee mechanic in local garages. Im not so keen on the newer models, I mean i appreciate the engineering and the incredible designs that are being developed to make cars faster and more economical. But i can’t seem to get my head around the advanced computers and endless electric gadgets they all have. Give me good old nuts and bolts any day. Which leads me to Beaulieu, the home of the National Motor Museum. I’m going to be honest it was probably a good five months ago that i actually visited the museum with my dad but i thought it was definitely was well worth a bit of a write up. The museum is on the grounds of an outstanding house and gardens which are all open to the public at a small price of course and are well worth a little explore if you have the time especially if the weathers not to shabby. In the gardens there are the remains of what used to be the old abbey, unfortunately these days there isn’t a great deal left to see mainly low level walls. There is also an out building dedicated to the history of Beaulieu’s secret army finishing school in the second world war. But onto my favourite part. When you enter the area towards the entrance of the famous museum you are first met by a short hall of fame, of the car world of course. In here you find a Bond car along with the trusty of Reliant from Only fools and horses among several other iconic cars from the TV and cinema. Around the corner from this hall of fame is what is know as Top Gear world. Exactly as it says on the tin, almost every Top Gear challenge car can be found in all its “glory” from the last 10 years or so. Including the infamous amphibious cars they built to try and cross the channel. The limos which quite frankly failed to be cars at all and the motor homes they built to tour cornwall. Well the two that were left anyway. Until you see them up close you don’t appreciate the fact that someone has actually taken time out of their day to engineer and build these crazy machine that we used to watch on our TVs being crashed and raced around the test track. 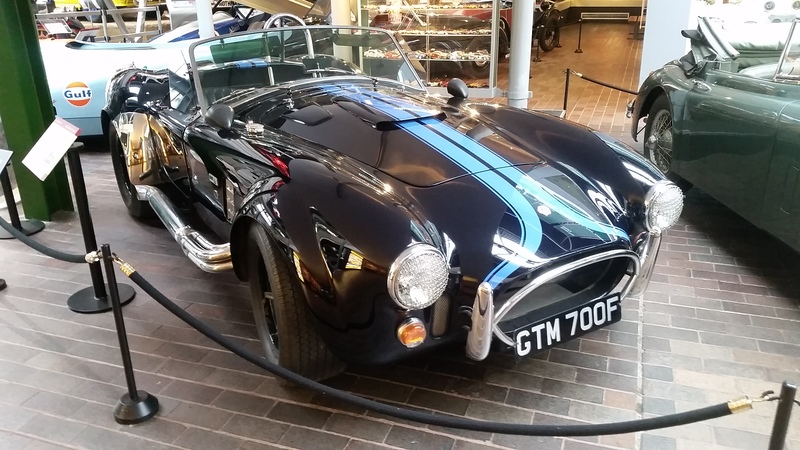 Once you’ve had a good explore around the hall of fame and Top Gear world the main attraction of Beaulieu National Motor Museum is literally around the corner. First walking through the doors you are met by what i personally think is an outstanding looking machine. The 1935 Auburn 851, admittedly they do change the car at the for front of the exhibit from time to time so if you were to visit this may not be the first car you see. However in this case it was the first thing i set eyes on. Once the fastest production car of its generation with a 4.5 litre supercharged engine i was dying to hear it running however it wasn’t meant to be. I have got a picture but due to the lighting being far to dark it doesn’t do the car justice therefore I’ve left it out of this post. Around the edge of this first room is a time line of car icons including the Ford Model T.
Walk through into the main hall and the time line begins, starting with the first machines built to carry people or goods right round to 21st century F1 cars and our modern day classics such as the Mk2 golf. I could literally talk about this museum for ever. Anyone who is enjoys cars or this type of mechanical engineering will absolutely love it here and most probably won’t want to leave. We actually ended up walking round several time just trying to take it all in. Just the vast range was incredible. World famous land speed record holders were sat next to priceless Rolls Royce’s and World Rally legends such as the Audi Quattro. I can’t even start to imagine the amount of time, money and effort that has gone into the restoration and care of every single vehicle in this building. It truly is something you have to experience for yourself. Most people will just say, well its just a room of old cars and motorbikes. But people who are truly into there cars and bikes. Who are as fascinated by the engineering and brilliance that has gone into each and every part of that machine as i am, will honestly understand what I’m saying when i say how amazing this place really is. Its like nowhere I’ve been before purely on scale and standard. I would 100% highly recommend a visit, even if your not that fussed by cars theres still the beautiful grounds to explore. I will defiantly be taking a trip back there in the future.